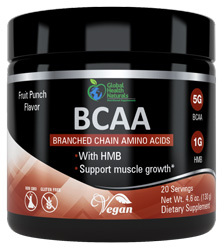 BCAA by Global Health Naturals, promotes healthy muscle mass and may reduce muscle breakdown through supplementation of branched chainamino acids and HMB (calcium B-Hydroxy B-Methylbutyrate). Studies show that BCAAs decrease protein catabolism (breakdown of muscle) and support muscle protein synthesis (muscle growth and repair). BCAA can be used before, during or after workouts or anytime of day to help preserve lean muscle and stimulate muscle growth. Ingredients: (per serving) HMB (B-Hydroxy B-Methylbutyrate) - 1000mg, BCAA Instant (2:1:1) - 5000mg. Other Ingredients: Red beet juice, natural fruit punch flavor, citric acid, malic acid, stevia. Suggested use: Mix one scoop into 8oz of cold water, juice, milk or your favorite smoothie.